This Saturday Race For Life London gets Cancer Research's flagship fundraising event off to a high profile start outside the O2 on the Greenwich Peninsula at 10am. The 5k races are hugely popular with the emphasis on participation and running for someone you know who's affected by cancer or in memory of a loved one but there are also 10k events for those struck with the running bug. Local races are taking place in Hammersmith, Richmond, Hyde Park, Hampstead, Finsbury Park, Crystal Palace, the City, Blackheath, Enfield, Croydon between now and the end of July so there are plenty of opportunities to get involved and raise support the cause. 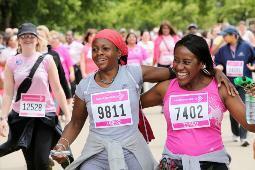 It is hoped over 700,000 women will take part across the UK in a bid to raise £60 million to help beat cancer. And it's not too late if you're inspired to join the O2 run at the last minute. There are still a limited number of free places available for people to take part. Find out more at www.raceforlife.org. PS the Jubilee Line is shut this weekend so take the Thames Clipper!